​From Monday 25 July, Go North East will be coming to Quorum Business Park with a new 554 route. There are a number of changes to services taking place in Gateshead and surrounding areas from 24 and 31 July 2016. The wheels on the bus industry are turning fast, writes Sophie Moorby. There are a number of changes to services taking place in North Tyneside and surrounding areas from 24 and 31 July 2016. ​Newcastle’s yellow Quaylink buses are thriving as passengers experience a more reliable service since it was revamped. There are a number of service changes taking place from Sunday 17 April, mainly to improve the reliability of our services. There will be changes to services 1 and 19 from the above date. 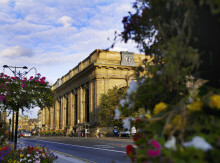 From Sunday 29 November, there will be changes to stopping arrangements at Newcastle Central Station.